REGULAR followers of this blog will know I’m hardly a fan of W, what with the stolen election, Guantanamo Bay, CIA agents being publicly identified, etc. But listening to The News Quiz on Radio 4 tonight has almost made me a supporter of the 43rd, even at this late stage in his presidency. It almost made me throw up listening to those so, so clever, self-satisfied, smug panellists (I exempt Jeremy Hardy from this criticism because he is actually funny) smirking loudly at Bush’s (admittedly phoney) Texan accent and laughing at their own witty observations about how stupid he (and therefore America) is. Anyway, back to W: whisper it, but no-one gets to be president of the world’s only super power by being stupid. Yes, he mangles his syntax more violently than John Prescott at an NFU rally, but just because he can’t swap repartie with Stephen Fry does not make him a hillbilly. His record on aid to Africa, for one thing, puts all his predecessors to shame. Admittedly, his record on just about everything else is rubbish, and, as I said, listening to The News Quiz only made me almost support him. But spare me the political “wisdom” of most (not all) of these Radio 4 comedians. Honestly, by the way the Toksvig sneers self-approvingly, you would think she’s a Liberal Democrat or something. 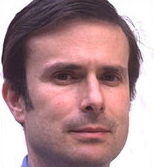 HE’S THE country’s most famous – and controversial – financial journalist, but the most obvious question about Robert Peston hasn’t yet been asked, never mind answered. 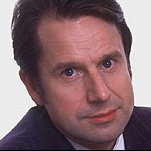 And it’s this: Are Peston and comedian Jeremy Hardy the same person? Or at least separated at birth, surely? Peston (left… I think) and Hardy.